At Saskia’s Nail and Beauty Bar we use Mancine hot wax, Clean n Easy roll on Strip wax system as well as Sugar wax. With the products and techniques, we use, we hope to achieve the best results and to prevent hair breakages, ingrown hairs, and redness, and to minimise the pain associated with waxing. We offer a quick yet thorough total body waxing and tinting service . Taking into account our customers individual waxing and tinting requirements. With a friendly and professional service there is no need to feel anxious or uncomfortable. We offer a quiet, relaxing, and private space for all our clients. Waxing is an affective yet semi permanent way to remove unwanted hair and achieve longer lasting smooth skin, to keep your legs and body silky smooth, a good habit using a loofah with a PH neutral soap free body wash at least once a week is highly recommended. This will allow the hair to grow back with less chance of ingrown hairs. Waxing lasts anywhere from 3 to 6 weeks. There are many things that can impact the wax results. 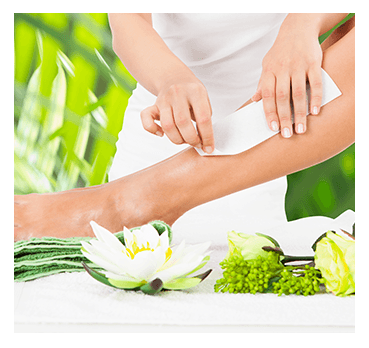 Weekly exfoliation with a loofah especially the day before your wax treatment using a gentle circular motion, concentrating on dry areas such as elbows, knees and ankles, will ensure the removal of any dead skin cells. This will help the wax stick to your hair and not your skin so when the wax is removed it doesn’t grip your skin resulting in a smoother wax with less additional pain. Rehydration is also important after your wax and your daily routine to maintain your silky smooth skin, once again focusing on the knees, ankles and elbows. The more hydrated the skin, the less sensitive it will be for your next wax leaving you with a quicker and more efficient wax. Brows that are well shaped can make an amazing difference to the appearance of the face, With tweezing, trimming and waxing and tinting the eyebrows, there thickness, contour and shape help to frame the eyes and balance the features of your face. After you a have had your eyebrows shaped and or tinted to the desired look, we recommend having your eyelashes tinted to further accentuate your facial features. This service popular for those who want to ensure that they have definition at all times and is also popular with clients who have light coloured eyebrows, eyebrow that are sparse or when the odd grey starts to show through. To make a booking for waxing and/or tinting call us on 0415 200 964. Our beauty salon is on the Gold Coast, handy to Highland Park, Nerang, Worongary, Gilston, and Carrara. Our opening hours are Tuesday and Wednesday 9am-5pm, Thursday and Friday 9am-6pm and Saturday 8am-1pm. We are closed on Sunday and Monday. After hours appointments always available.